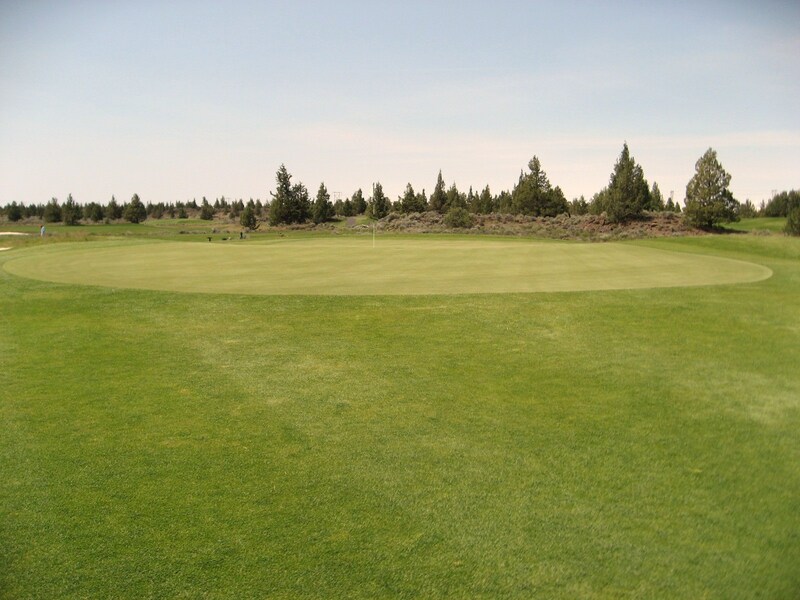 Greens Fees: $30 to $64 depending on season and time of day. 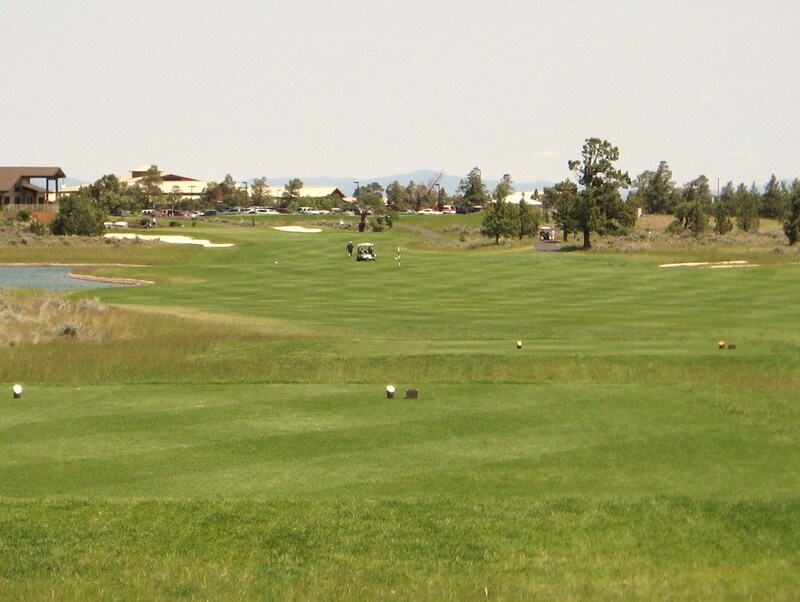 Juniper Golf Course was rated as one of the “Best Places to Play” by Golf Digest in 2008/2009 which does not surprise me at all. 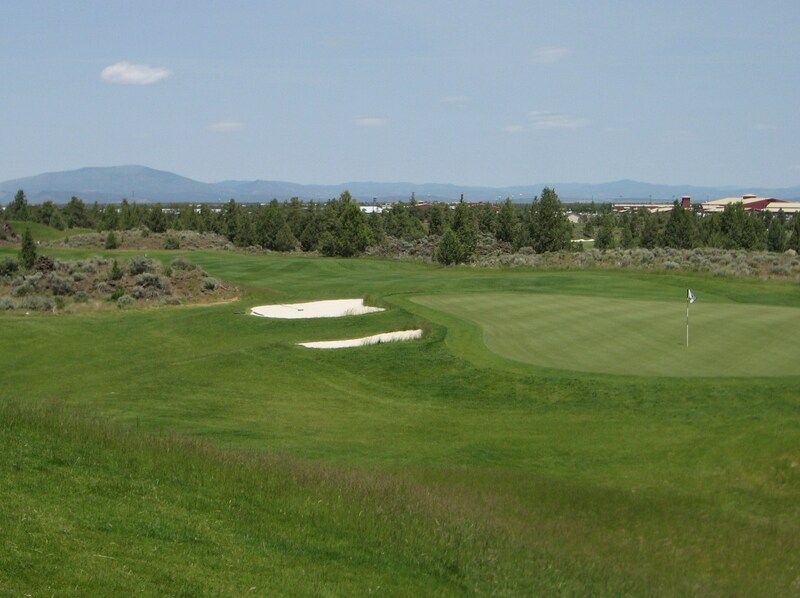 The course, which opened in 2004, is located on 177 acres of rolling high desert terrain in Redmond, OR, and it is an excellent example of “natural” golf course. Juniper is semi-private and receives a great deal of “visitor” play, especially during the summer. John Harbottle was hired to make the most of what the land offered him on a relatively small budget and he delivered a fantastic product. 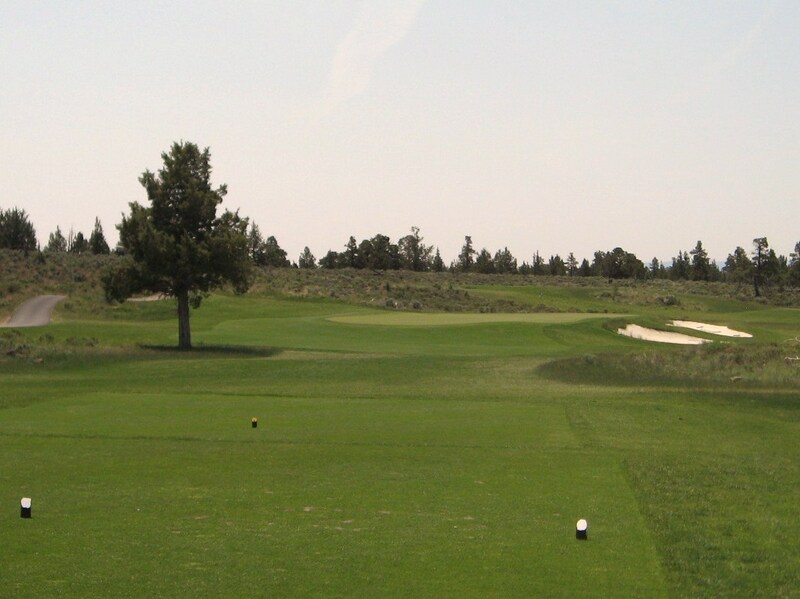 Juniper is one of the most natural looking courses I have played in the US, and actually reminded me of courses in Ireland because the holes are built over the land, not through it, and it is obvious that very little dirt was moved in construction. 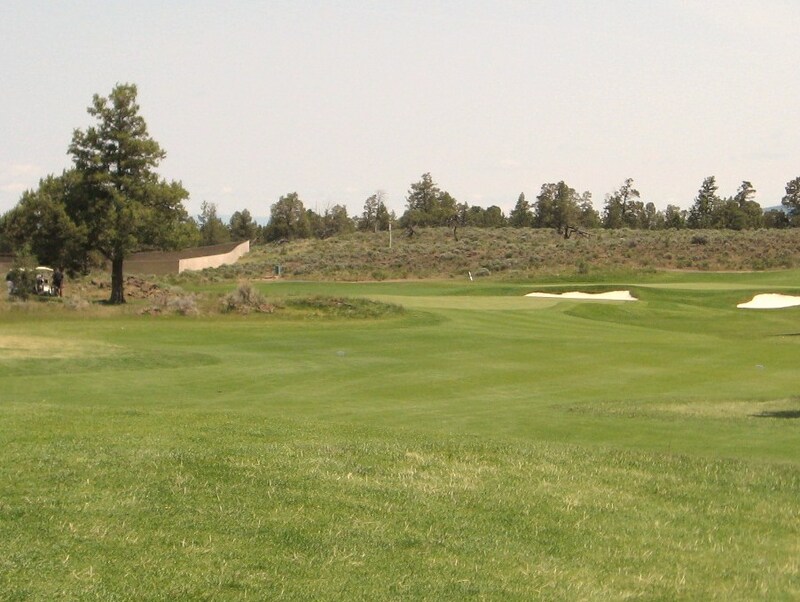 Juniper is a great walk through the high desert and, as pictured below, every hole has walker friendly paths cut from tee to fairway and from green to tee as necessary. This not only minimizes overall walking distance but ensures that walkers do not have to trek along cart paths instead of being able to enjoy the stroll across the terrain as golf was intended to be played. Walking path cut through the brush at Juniper. The two shot first starts with a semi-blind tee shot that should be aimed at the middle tree in the distance beyond the ridge. 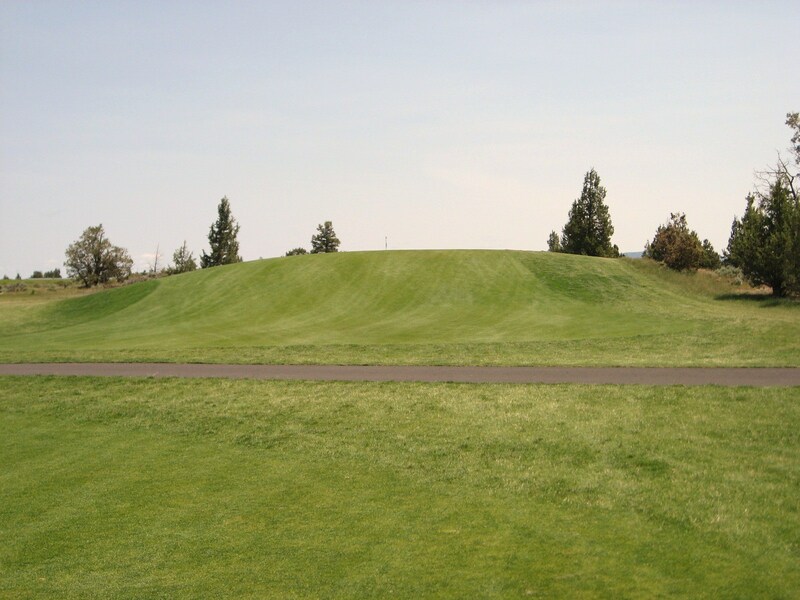 Shorter hitters may not reach the top of the hill so they will have a blind second while the longer hitter will carry a well struck drive to the 150 yard marker. 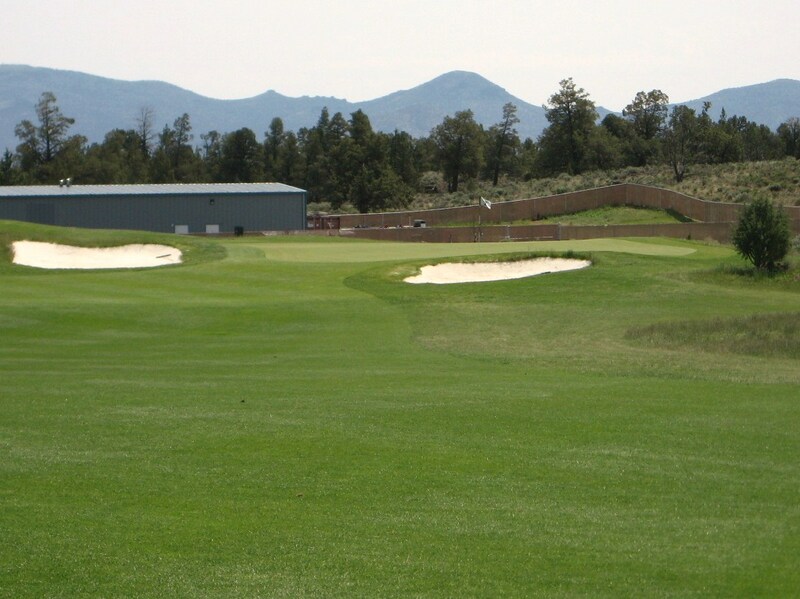 The fact that the first is a semi-blind tee shot hints at what the golfer can expect at Juniper – a course that flows naturally across the land with little regard for modern architectural conventions that call for clear lines of sight on every shot. 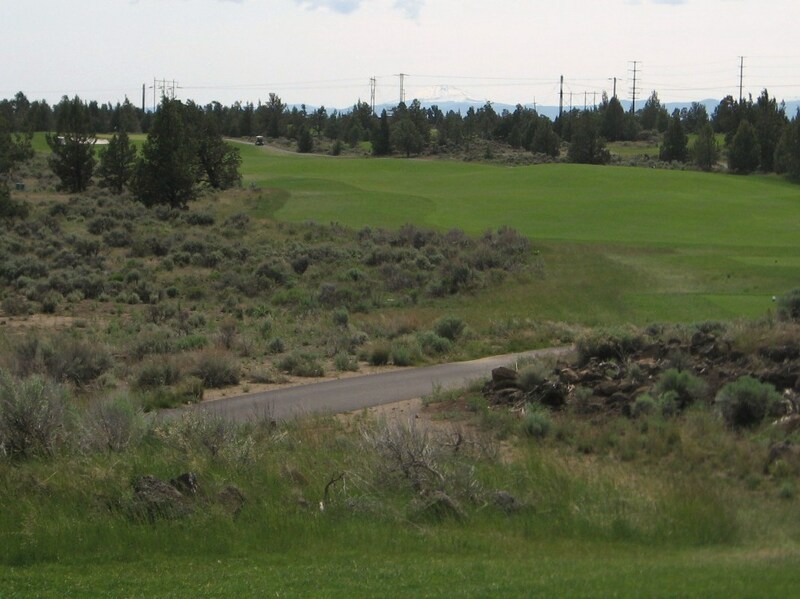 Harbottle did not level mounds or flatten hills as many other architects would have done, and the course has benefited significantly from his “subtle” hand. 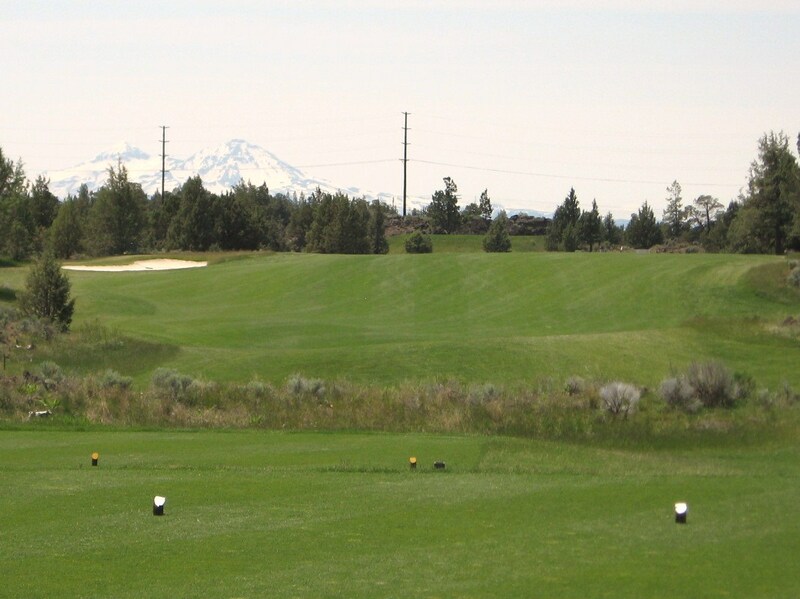 The Cascades greet the golfer as he reaches the top of the small hill and looks down towards the green below. The putting surfaces at Juniper have subtle undulations and are kept in excellent condition, which makes them thoroughly enjoyable to play. A closer look at the green shows that there is room to run your ball up while a little ridge running through the middle adds some complexity. 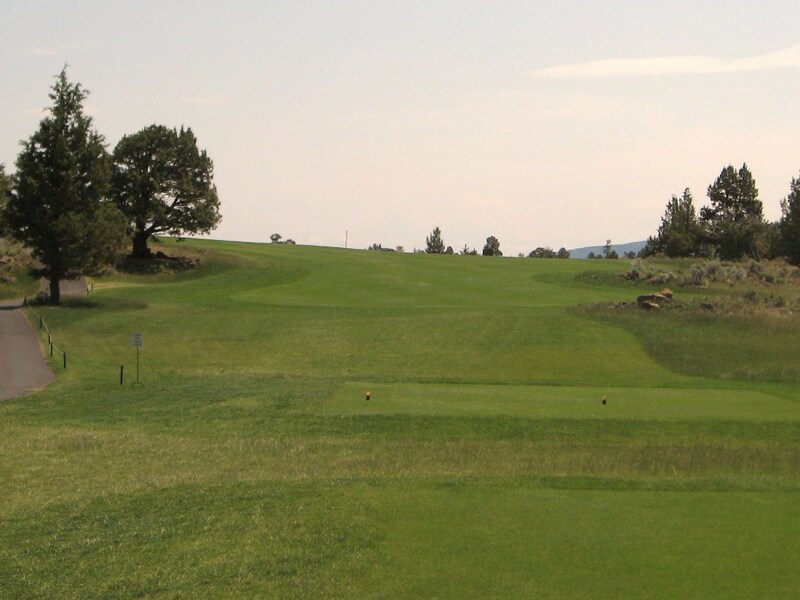 The second is a par four that moves up a small rise before turning to the right and descending to a slightly raised green. Again, the tee shot is semi-blind and should be aimed down the middle, or to the right side of the fairway if you want to try and cut the corner. The putting surface runs from back left to front right and is bunkered on the left, right and front. There is plenty of depth for a mid or long iron to hold the green, although many golfers will have a short iron approach. The third green may look shallow off the tee but it is actually quite deep so make sure you are clubbed to the proper pin location. As with the other one shotters at Juniper, the third is pretty straight forward, what you see is what you get. 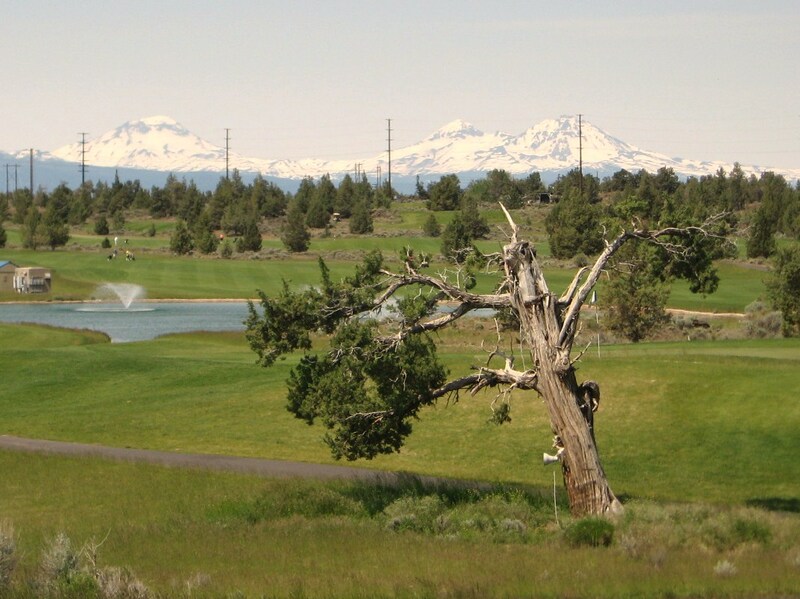 The view from the fourth tee provides a panoramic view of the Cascades, while the tee shot itself places a premium on both distance and accuracy. 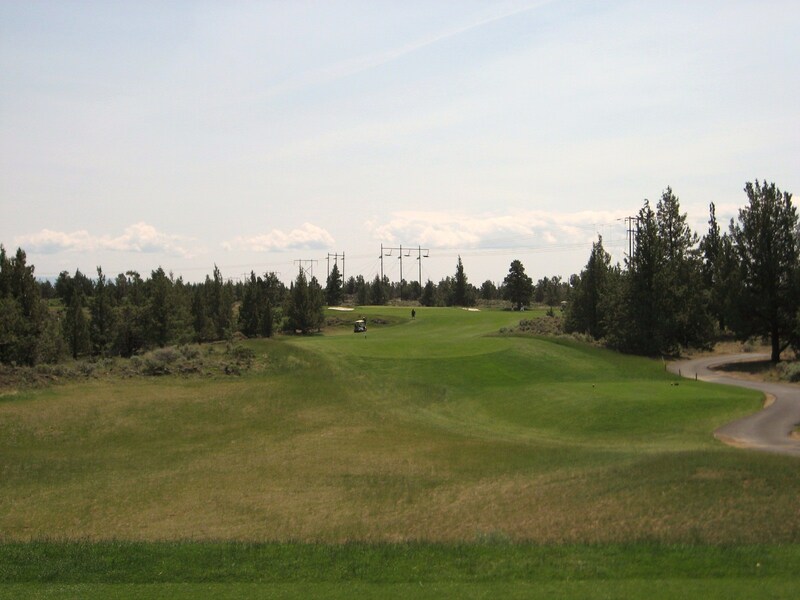 The rumpled fairway leads to a strip of native vegetations and high desert that is located about thirty yards in front of an elevated green. A driver may not be necessary off the tee, as a fairway wood will probably put the golfer in an ideal position about 120 yards out. 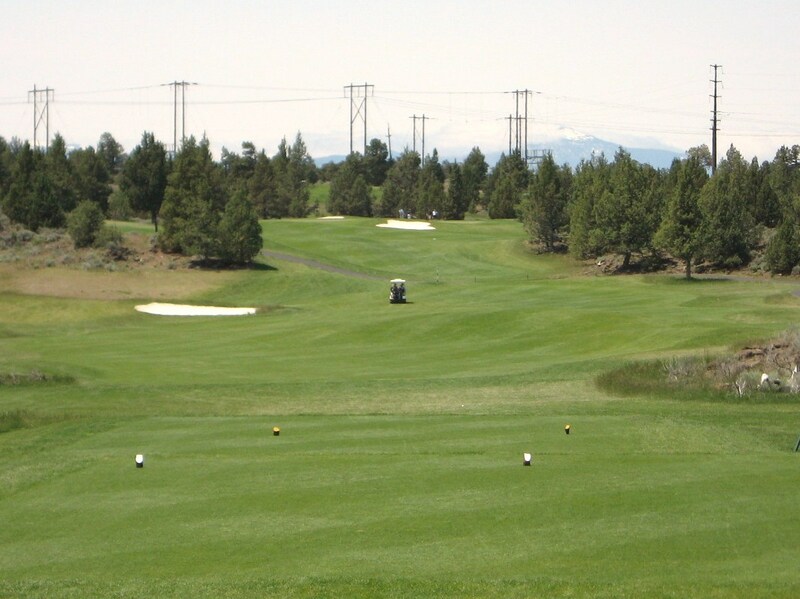 The approach is difficult to the skyline green so check your distance and aim for the middle. Bunkers await a push or pull on either side of the putting surface. I happened to find the one on the right side and enjoyed playing out of the fine white sand. 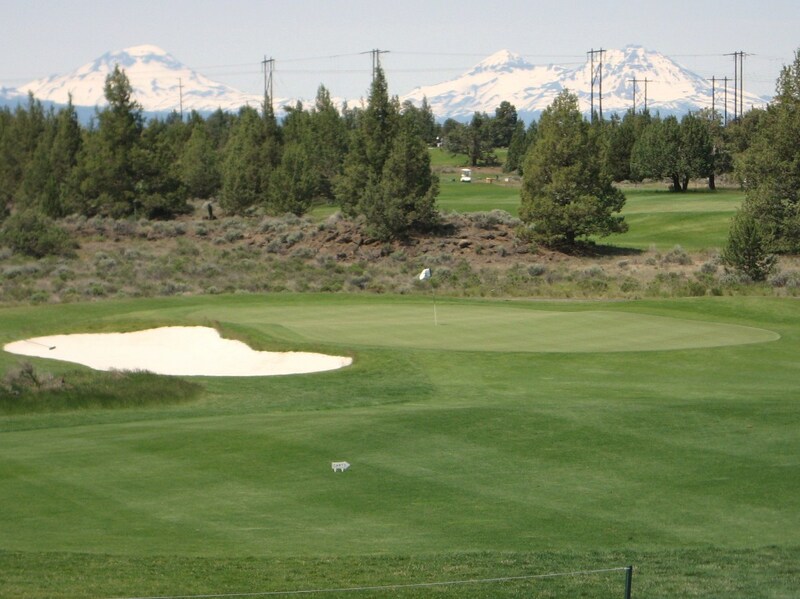 Juniper has a good balance of long and short par fours which results in a nice variety of tee shots and approaches. Many of the greens, however, are raised which adds length to the approach. The fifth is a challenging long par four, especially when playing into the wind as is normal. Harbottle has routed the hole so that the golfer will naturally direct a tee shot to the right side of the fairway, which means the approach will be played from behind the large mound on the right side of the fairway. This mound is a wonderful feature that adds a lot of character to the hole. Anything in line with the 150 yard marker will provide a decent look at the green. 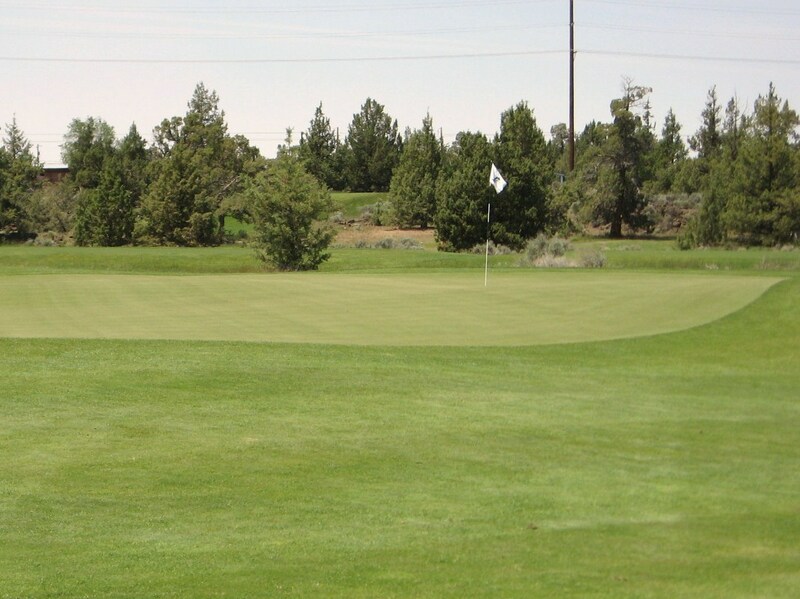 The approach to the second is often blind as the mound and high desert block any view of the pin or the green. There is a room to bail out along the left side of the fairway, but two well positioned bunkers guard that side of the green and will snare any approach that is just off target. 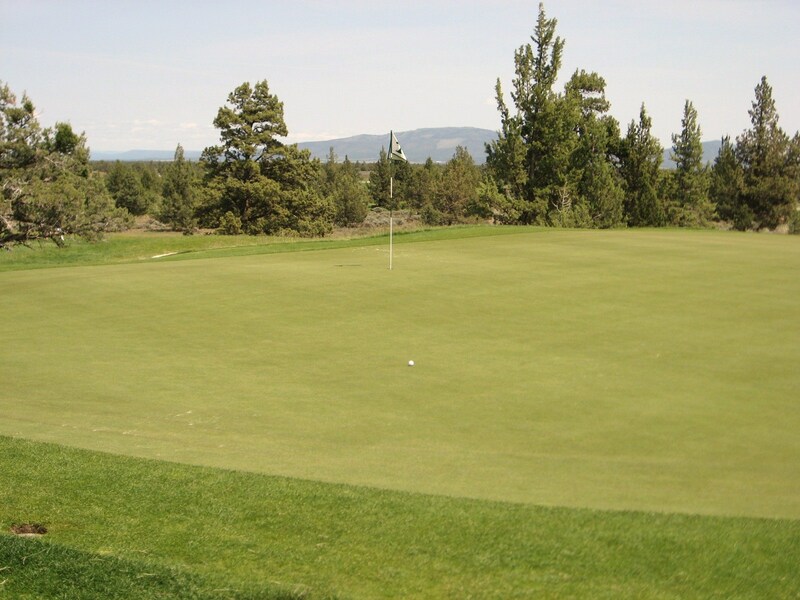 The putting surface is relatively flat so if a golfer is on in three they will have a reasonable chance to get down in one for par. 5th Green Complex at Juniper. The sixth and seventh are back to back three shotters – further proof that the architect routed the holes over the land as he saw fit, with little regard for normal convention. 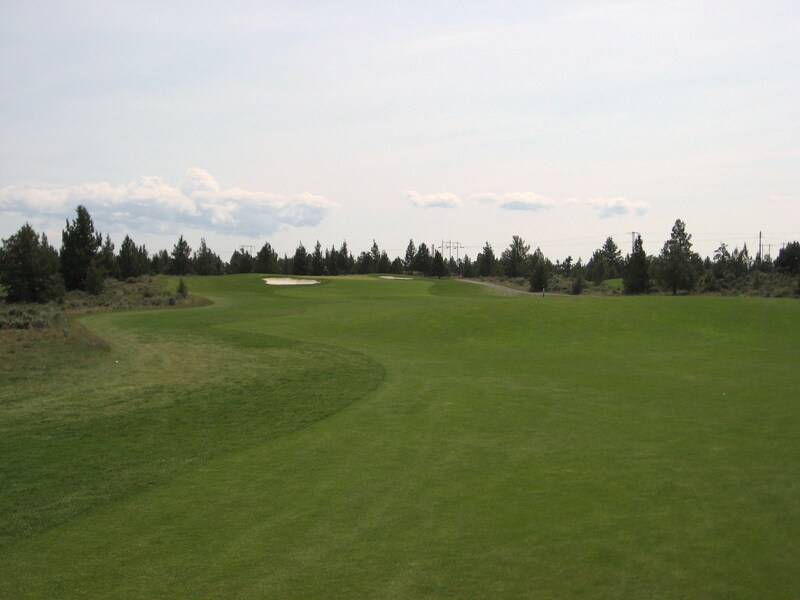 The sixth is a long par five that tends to play with a tail wind so it may be reachable for the tiger golfer. There is a lot of room off the tee but the best line is at the tree behind the large mound in the center of the picture below. A good drive will still leave a long second that is blind. The green is located behind the mound and slightly to the left. How often do you see a shot like this at a course in North America? Fantastic stuff! Mound on the 6th at Juniper. The 150 yard marker is located on top of the mound, so there is still a little ways to go before you are home. It takes a very well placed wood to run your second onto the green as native grass juts out on the left and there is rough on the right. 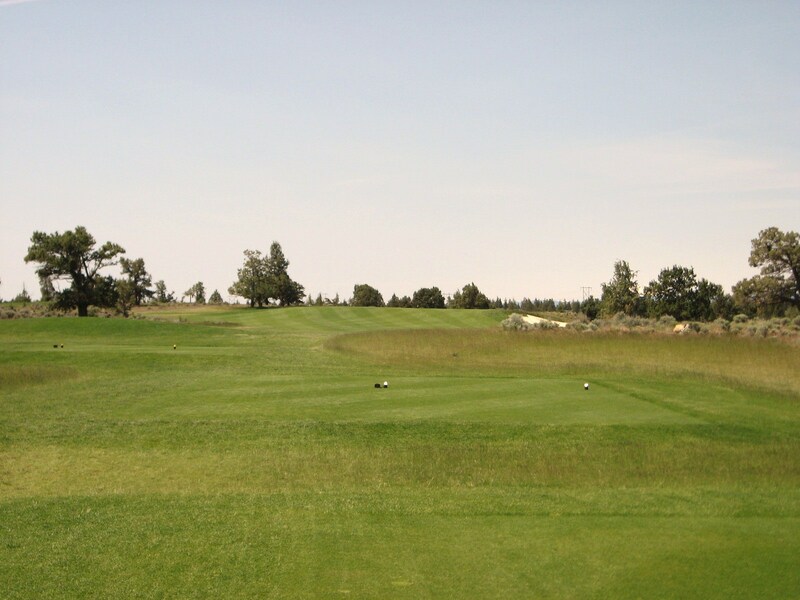 The seventh usually plays into the wind and the length of the hole is increased by the uphill approach. 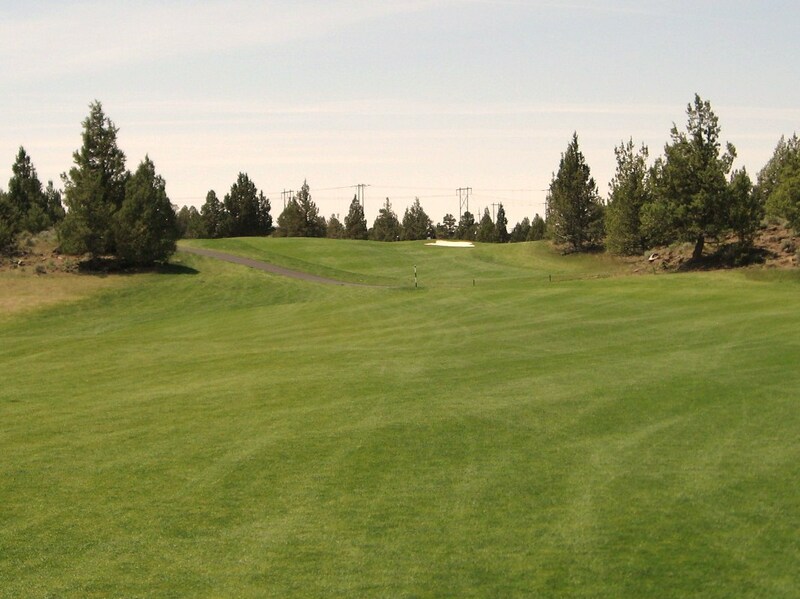 A wide fairway awaits the slightly elevated tee shot and the best line is straight down the middle. Hitting the green in two is difficult as the bunker in the photo below sits up against the middle of the putting surface which is wide and shallow. 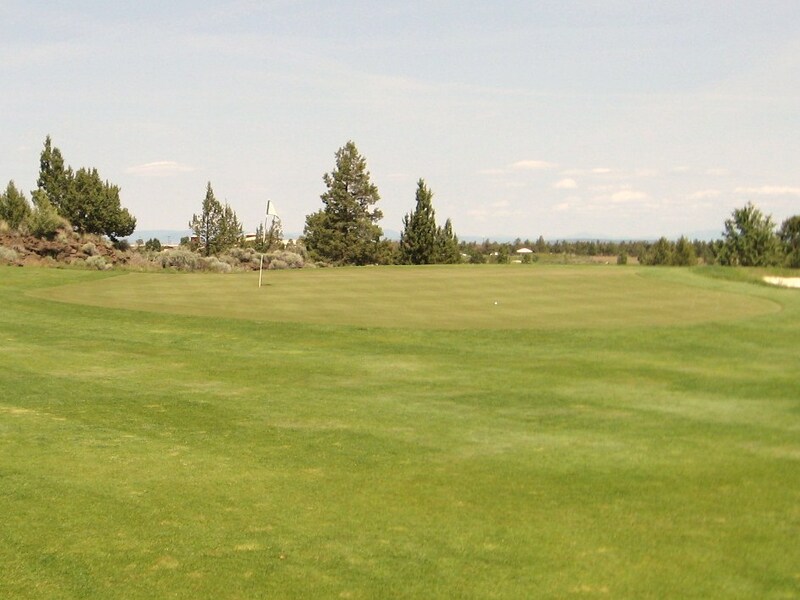 A lay up to 100 yards still leaves a semi-blind approach to the green. I really enjoy how the putting surfaces at Juniper seem to sit naturally on the land with a nice amount of movement that does not look contrived. The one shot eighth is the longest par three on the course. The green is fairly narrow but deep as it runs at an angle from front left to back right. A lone bunker guards the right side while the land slopes off to the left and backside of the green. The ninth is another long par four, although there is usually a tailwind. 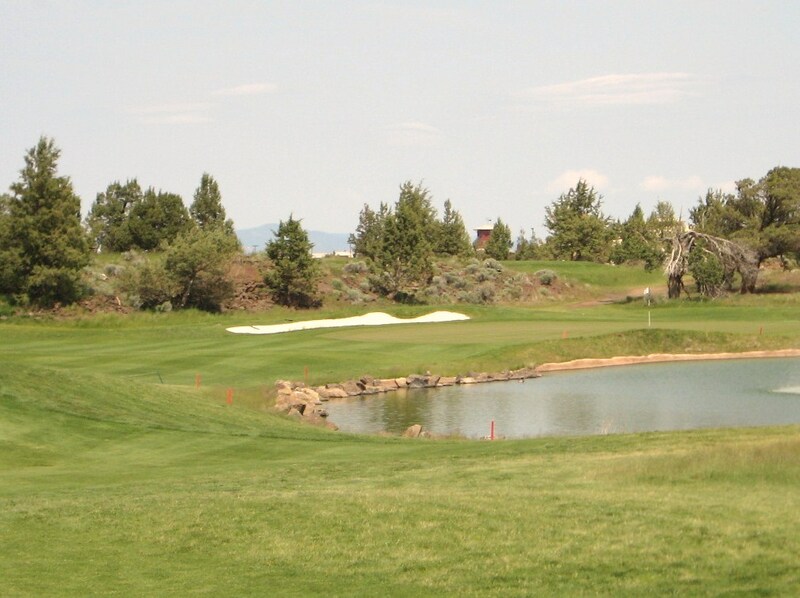 Two irrigation ponds were constructed out of necessity and both come into play during the round. The larger pond is encountered on nine and eighteen, while a smaller one is in play on fifteen and seventeen. 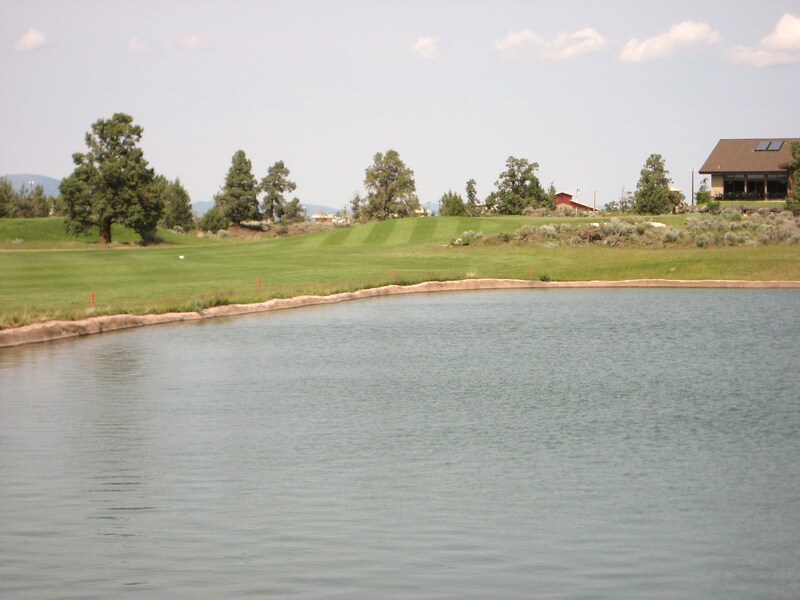 These ponds certainly seem out of place on a course in the high desert, especially with the fountains, but they had to be built and the architect could not route the course away from them due to limited space. On nine, the pond really should not be in play off the tee because the optimal drive will land in the right side of the fairway which will open up the rather long and narrow green for what will probably be a mid to long iron second. The green is slightly elevated and completely protected on the left side by a long bunker, so an approach coming in from the left side of the fairway will be a lot tougher than one from the right. 9th Green Complex at Juniper. The back nine starts with a reachable three shotter that plays into the wind. 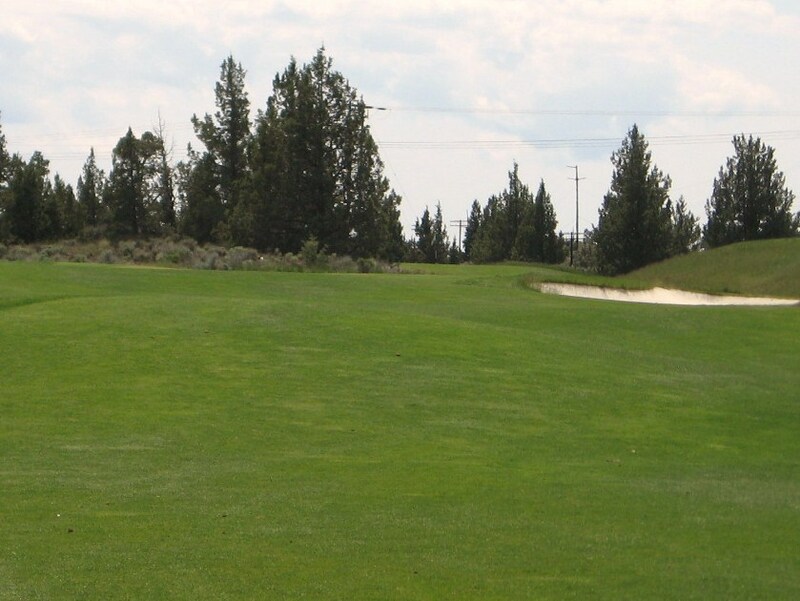 A ridge crosses the fairway about 225 yards off the tee and a long drive over the mid-right side will get a nice turbo boost off the downslope. The green is open in the middle, but well bunkered at the front on either side. 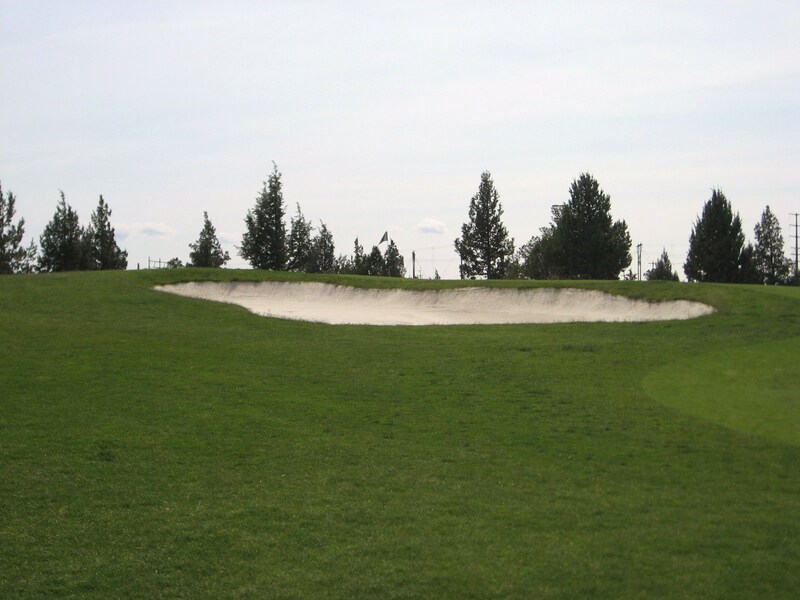 There is another bunker short right to penalize the golfer who goes for it but pushes or fades their fairway metal, and more sand waits at the back for the golfer who brings their approach in too hot. The tee is located on the far left of the photo below, next to a lava mound, which is really cool. 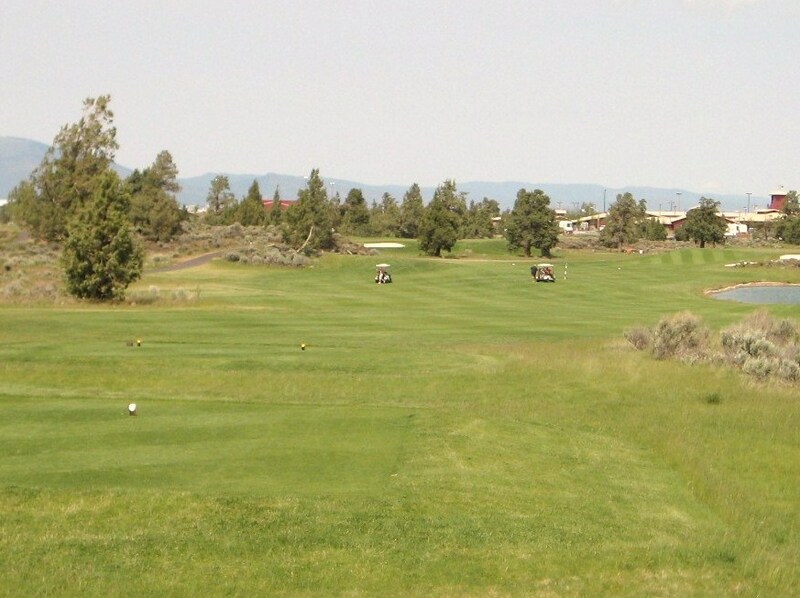 A fairly wide fairway awaits the downhill tee shot, which is followed by an uphill approach. A common theme at Juniper. 11th Hole from behind the Green. 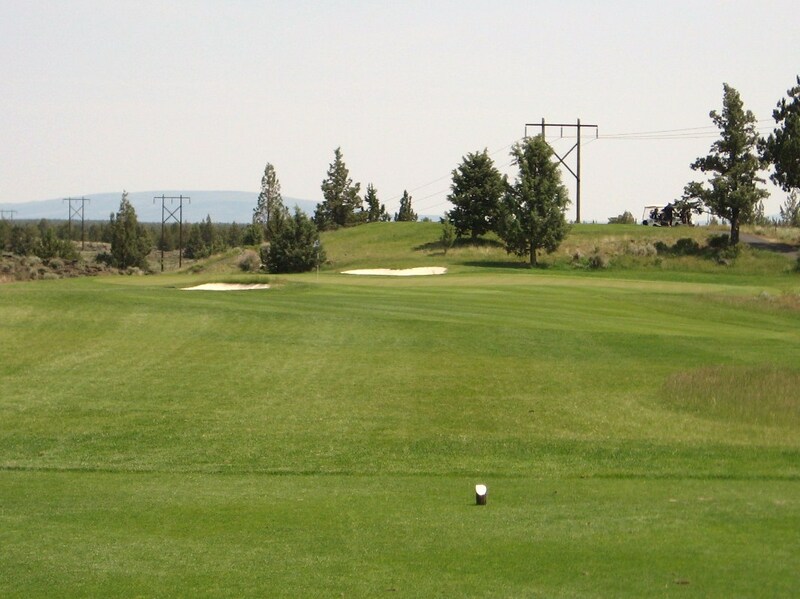 It can be difficult to gauge your distance to the pin since the green is forty paces deep and slopes off the back. Approach to the 11th at Juniper. Twelve is a great short par four that will quicken the pulse of anyone who can carry their drive more than two hundred and fifty yards. The green sits up slightly so you need to keep your tee shot straight and true to get it all the way there. A hook or slice will probably be lost so unless you are confident with the big stick a lay up may be the best play. A properly struck drive with can find its way onto the green and leave an eagle putt as illustrated below. Unfortunately this one did not drop for a two. Thirteen is the easiest hole on the course. A short and flat one shotter to a wide green that is protected on the left front and back with two small bunkers. Fourteen moves left to right off the tee so the golfer has the option to take it over the bunkers or just right of the 150 yard marker. The aggressive line off the tee will provide a short iron into the green but the angle is much better from the left side of the fairway. The green moves front left to back right and is protected on the right side by two bunkers. There is a lot of short grass around the green which makes putting or a bump and run a good option if you are not on the dance floor. 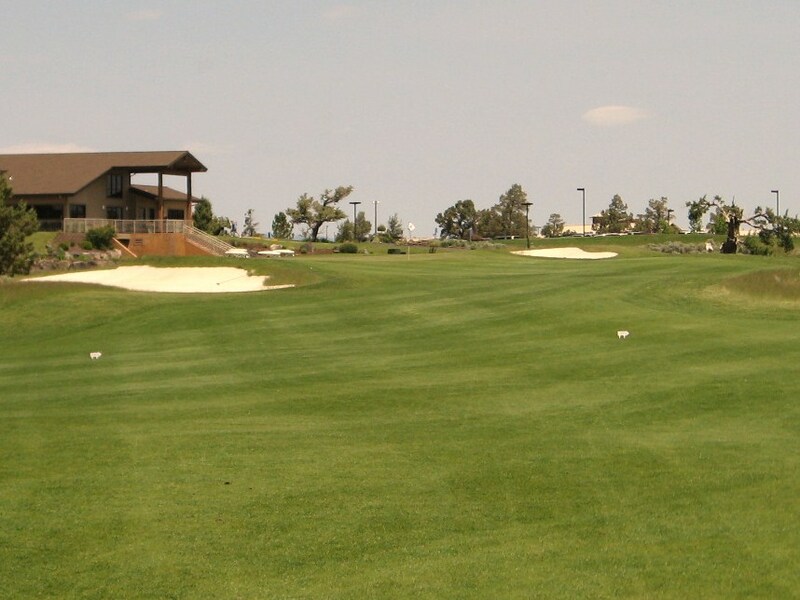 The fairway at fifteen has a lot of movement, so although the hole is similar to fourteen it looks different. The wise play is probably to the 150 yard marker which will leave a good angle over the water into the green. A big drive that tails off to the right can run all the way into the pond. From the fairway, an approach into the center of the green is the correct play unless you need to make up ground in a match. 15th Green at Juniper from the right rough. With a prevailing tailwind the sixteenth plays shorter than its yardage. The green is located at the bottom of a left to right slope that can be used to kick drives onto the front of the putting surface. At forty paces deep, a tee shot to the wrong section of the green can leave a long birdie putt. 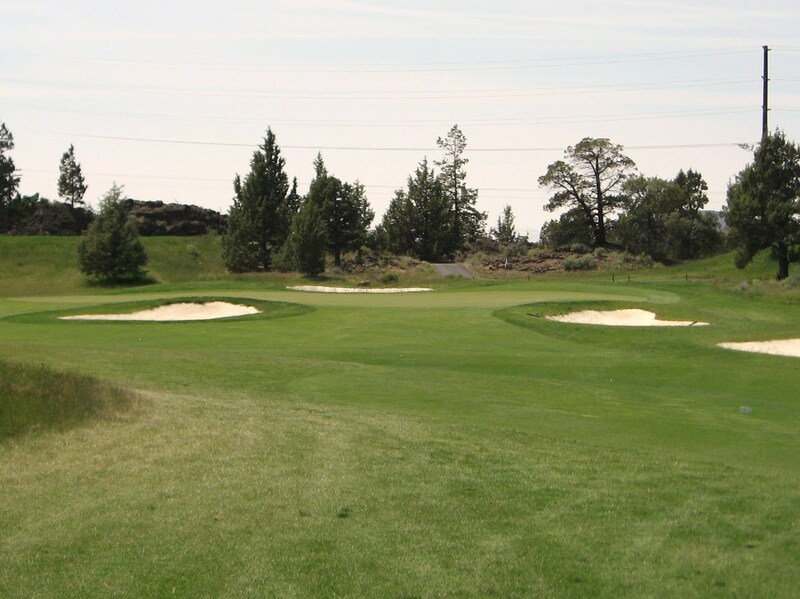 Seventeen and eighteen are a great pair of finishing holes, especially for a match. The seventeenth is a long par four that requires two well struck shots to get there in two. A big hitter can cut the corner on the drive which will still leave a long iron into the uphill green. Even after a good drive there is a long way to go and the right and left bunkers place a premium on accuracy. Approach to the 17th at Juniper. Anything short left will result in a challenging uphill chip over the bunker and it is very difficult to gauge distance to the pin from this angle. Short of the Seventeenth Green at Juniper. With the wind, eighteen plays like a long par four, so it is a good chance to get a shot back or make a birdie to win the match. The water to the right is definitely in play off the tee but less so on the approach. 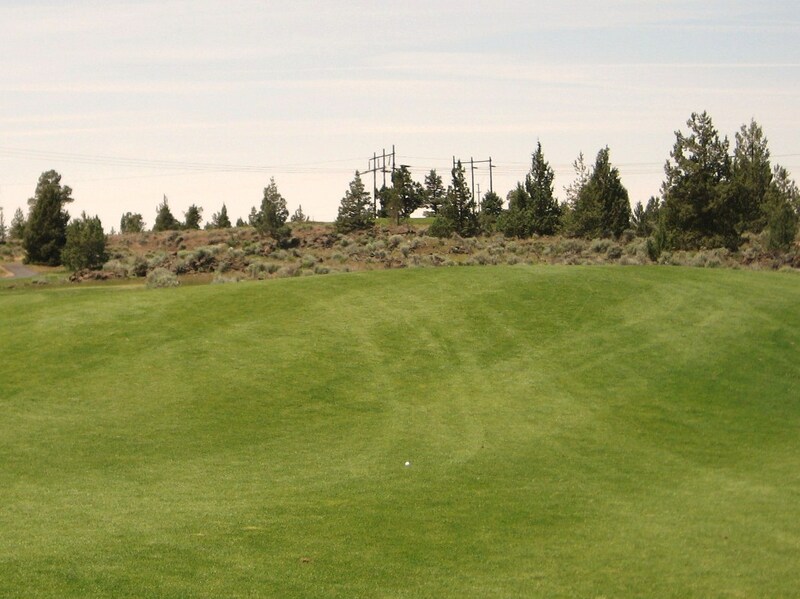 A drive to the left side of the fairway will leave a good angle into the elevated green. Even if you hit it in the water, a hybrid or long iron can get you on the green in three with a look at birdie. The water is not in play on the approach for anyone who is trying to get there in two. Approach over water to the 18th Green. A deep bunker protects the front and the grass around the left side of the green has been cut short so an approach that runs out of steam will collect at the bottom of the hill. 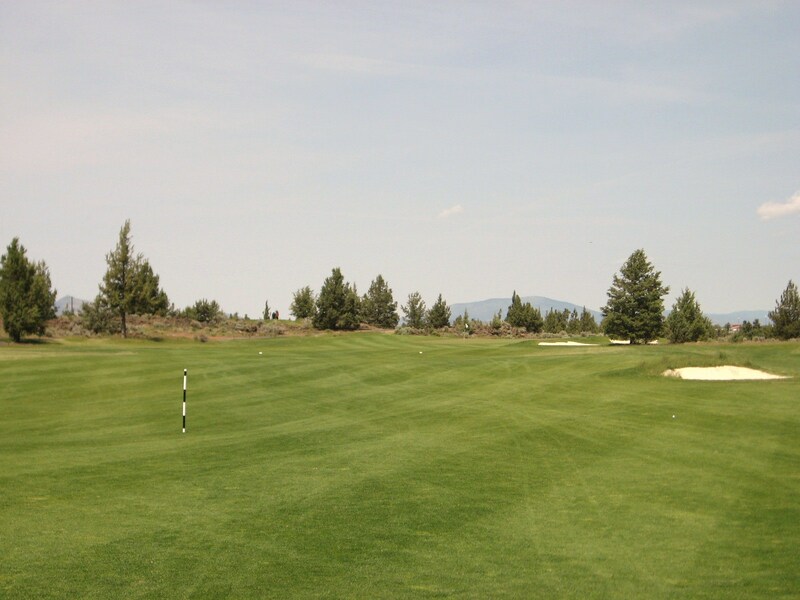 The putting surface is about forty paces deep with some undulation so a two putt is not guaranteed. 18th Green Complex at Juniper. 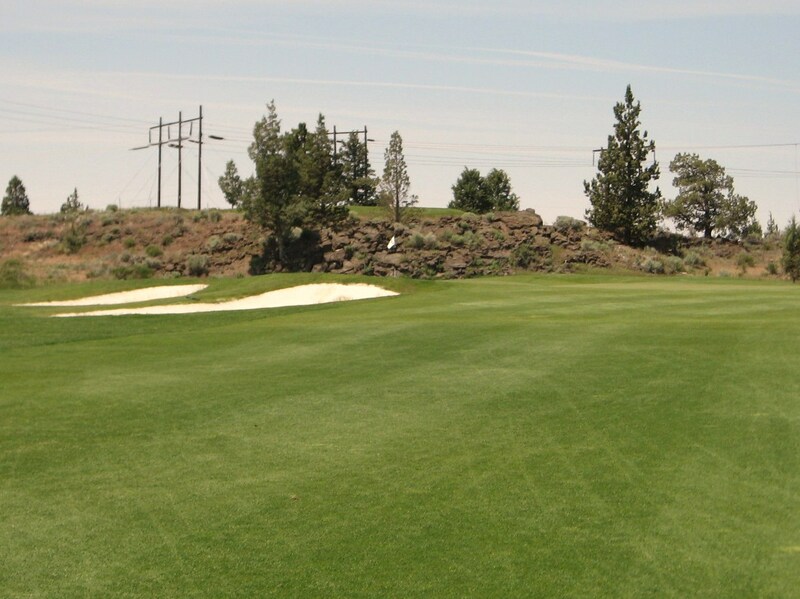 Juniper would be a great home course to play because it possesses a lot of really fun holes. John Harbottle has done a terrific job of routing the course across the property to keep golfers engaged for the entire round, and Patrick Reilly and his team keep the course in excellent condition. In terms of Walkability, Juniper receives 3.5 out of 4. The terrain is not flat, but the elevation changes are not overwhelming or daunting. 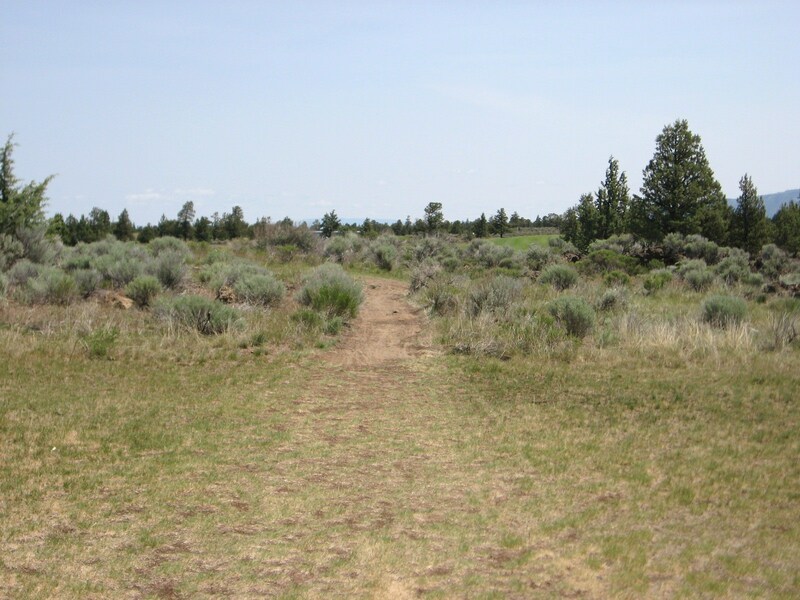 Green to tee walks are short on most holes, and many walking paths have been cut through the scrub brush and high desert where appropriate. Juniper is a great walk that I look forward to enjoying again. The Architecture and Aesthetics of Juniper are very good. 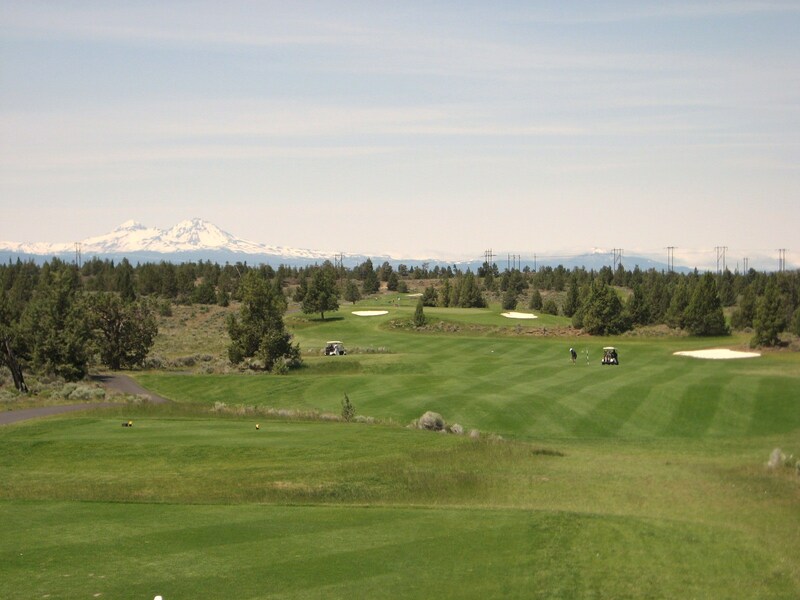 The golfer will experience spectacular views of the Cascade Mountains throughout the round and the course has been routed thoughtful and naturally across the land. While the one shotters are all fairly flat and straight-forward, most of the two and three shot holes have interesting and challenging tee shots and they play to varying lengths. Harbottle has a good mix of long and short par fours, along with reachable and true par fives. I would rate Juniper a 3.0 out of 4 for Architecture and Aesthetics. The Strategy and Playability of Juniper is excellent, a 1.5 out of 2. There are seven different tee combinations which provides every golfer with the right blend of distance and difficulty for their game, making Juniper very playable for golfers of all levels. That being said, to score well on this course, it is important to choose the appropriate line off the tee while ensuring that approaches are placed in the correct section of the green. 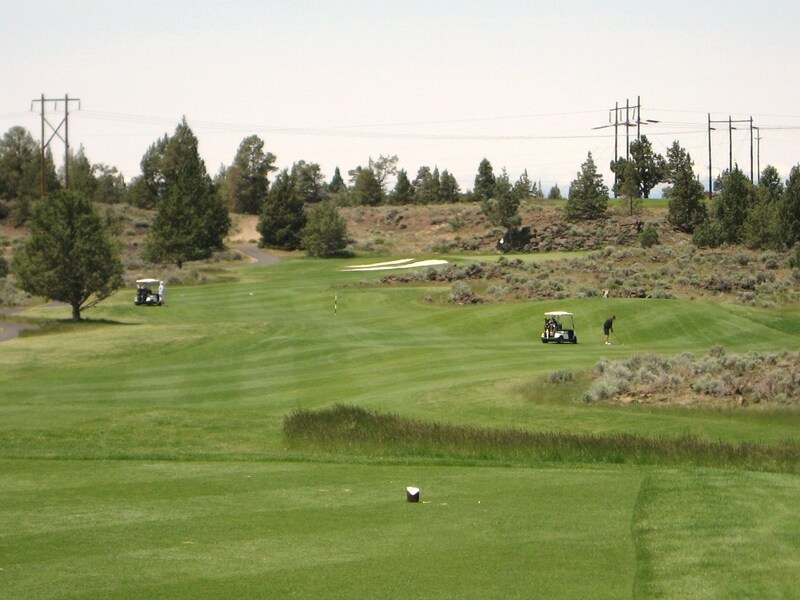 The fairways are wide enough to be friendly for the high handicapper, but the high desert and scrub brush will gobble up a long and errant drive. The greens are angled and protected enough to make approach shots challenging, and the natural subtle undulations make putting harder than you might expect. 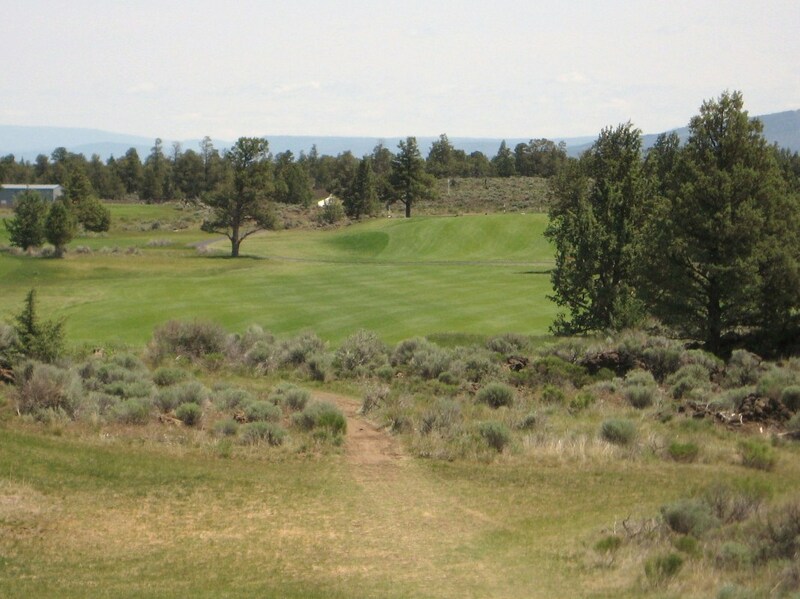 The Walking Golfer firmly believes that Juniper should be a north star that other public courses around the country should be following. 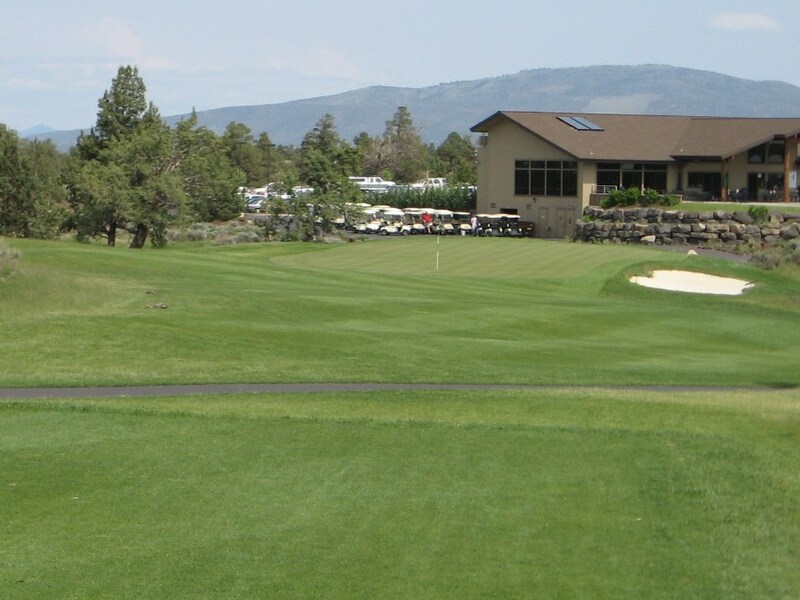 Juniper is a great walk and it has been routed naturally, thoughtfully and affordably across the property which allows greens fees to remain extremely reasonable throughout the year. 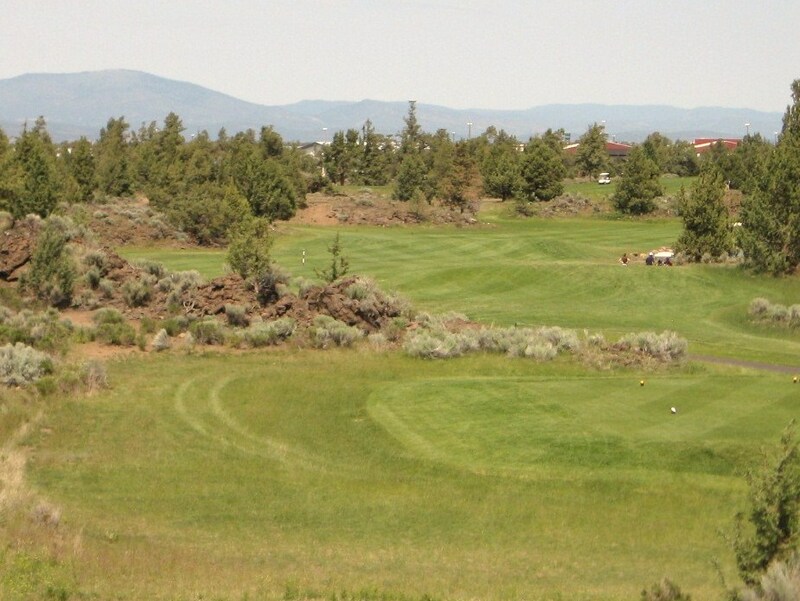 The semi-private model brings in a steady stream of revenue from local members who get to play Juniper at a great price for almost twelve months a year. 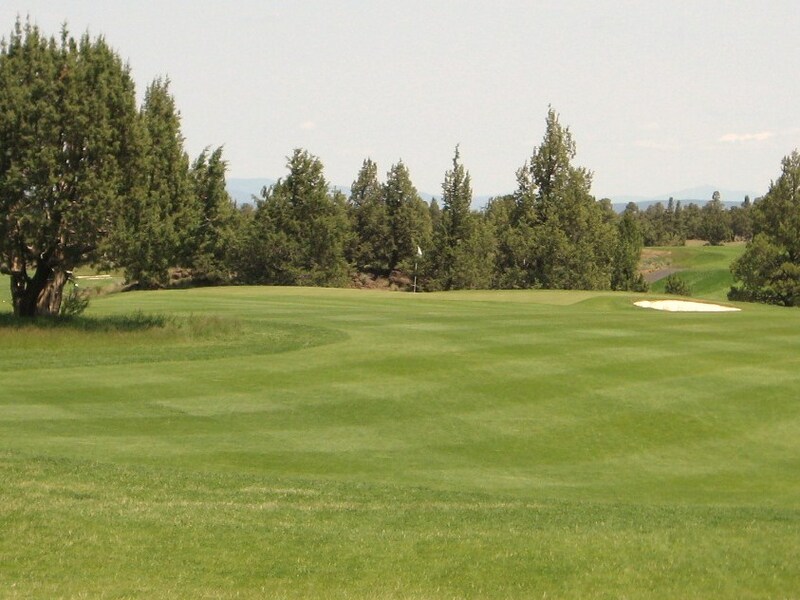 Most of the other top courses in Central Oregon are charging north of $125 per round during the summer and they can be difficult or impossible to walk. 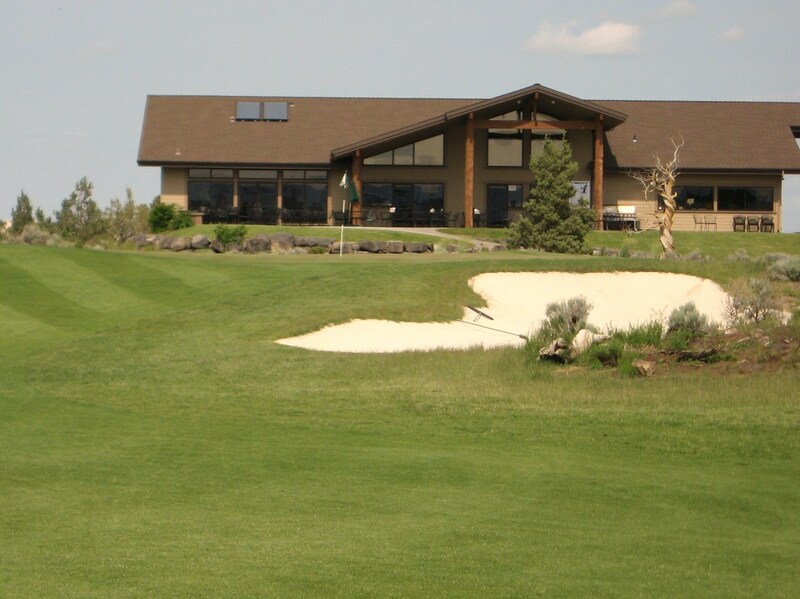 Juniper is a wonderful golfing experience that rivals anything else in the area for half the price. 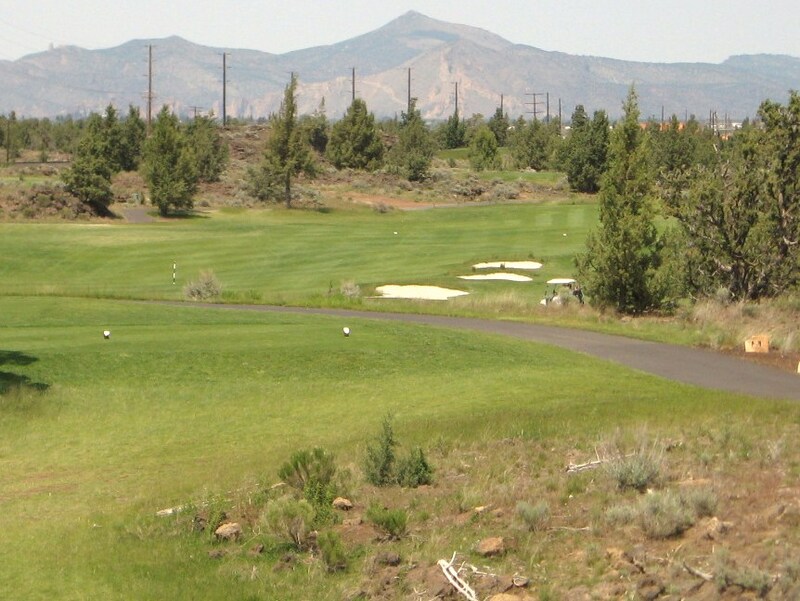 Juniper is a must play for any walking golfer visiting the Bend area.